Another mainstream chart hit for Rave ’92, one which has cemented itself into the consciousness of the Great British listening public thanks to that stuttering name-check announcement. Stylus Magazine is closing – I never read it as much as I ought but there was some good stuff in it, especially William B Swygart’s Singles Jukebox blog. This started off as WBS’ rantings about the week’s UK Top 40 – a strangely heart-warming tightrope walk between despair and enthusiasm – and then morphed into a team blog, Focus Group style. I contributed myself – a lot of the time writing brief singles blurbs was a method of shaking myself out of writer’s block and frankly looking back most of my contributions read that way. But some of them were decent, and in a shockingly egotistical tribute here are six reviews I submitted that I’m still pretty pleased with (ta to Cis for the idea!). The link’s still on the sidebar – search the archives for better stuff by other people, and a big thankyou to William for running it and giving us all the opportunity. In a move similar to The Freaky Trigger Top 25 Grants, one of our entries is not a Brand like the others. Where the others are marketing heavy representatives of an ethos, structure and mindset behind a product, number 16 is a person. A famous person admittedly, and one whose own recent meteoric rise (and partial fall) was peaking when we created the list. We were also quite drunk. 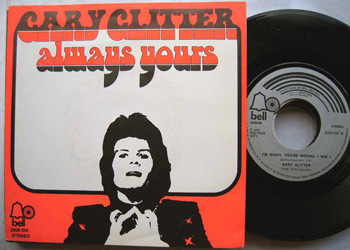 Gary Glitter is a liability on his own record: “Always Yours” sparks to life each and every time the backing boys yell the title hook, and then the momentum gradually putters away as weak-lunged Garry oohs and aahs and cheeky-boys through the verses. One foot in light entertainment and one in rock’n’roll, the single has pace and punch but ultimately never manages to successfully marry its bovver and brylcreem sides. This album came out at a troubled time for its superstar singer. The singer had hit international fame with a provocative, ambiguously sexual image, and had then gone on to work with some of the hottest names in black music – though many critics derided the results as plastic and fake. But they were dogged by rumours of drug addiction and bisexual decadence – a lifestyle apparently spiralling out of control, despite the responsibility of a young family. Their recent public appearances ranged from worrying to bizarre – the singer looked ill and distanced, and one performance in particular had raised the press to fury leading to mutterings of “career suicide”. To make matters worse, this new record relies on slick, hyper-modern pop making heavy use of electronics and treated vocals – in fact on several tracks the singer seems hardly to be present, off at the margins of the music. Its fashionable production team, on the other hand, has a huge impact on the album’s sound and must surely take a great deal of the credit for the success of the record. Whilst I am happy that the Wispa is back (it’s chocolate heaven, I ate it an hour ago and I’m still on a lovely bleary fuzzy high – Green & Blacks and Montezuma et al can just… fvck off until they get with the cocoa butter), the Cadburys Wispa microsite is the worst thing ever. I hate all Flash animation ever and it must die. I also mean YOU, Lucky Voice. And there’s more but the Cadburys website is somehow stopping my keyboard from reacting so I’ve had to close it! Resign, internet. Long Live The UK Music Scene! My latest column for Pitchfork looks at tastemaking and consensus in British music. It’s an ambitious column- almost certainly too ambitious, so I’ll use this post to briefly talk about some of the stuff that didn’t get in it and also reply to the criticisms I was making myself in my head while I wrote it. Real actual poster for winning party in recent Swiss elections. Where is the political correctness WHEN YOU need it to go mad? So You Want To Be A Blog N Roll Star? Idolator has been having a good deal of snarky fun about the OiNK bust, and it’s been very entertaining to read, but the fast-moving nature of that site means that the most interesting post of the last few days, Jess Harvell’s despairing analysis of the MP3 blogosphere and the nature of the hype it generates, is already off the front page. It’s well worth reading, though (and most of the comments are smart too). A couple of the commenters on that thread put forward the idea (also seen in PGWP) that the rise of the MP3 blog is a “British-ization” of the traditionally slower American promo and hype cycle, with Pitchfork and Stereogum playing the NME and Melody Maker*. Specific parallels aside, I think there’s a lot of truth to this: it’s a structural shift which even the downfall of something as big as OiNK won’t really slow. Jess’ main point is that the hype cycle is damaging to bands as well as to criticism – new bands barely have time to make an impact before their new fanbase turns on them. There’s definitely truth in this, but I grew up in the UK with a similar level of turnaround and actually being a fan in those kind of hothouse conditions is terrific, weirdly exhilarating.